Accurate measurements will save you many steps and a lot of time and money. 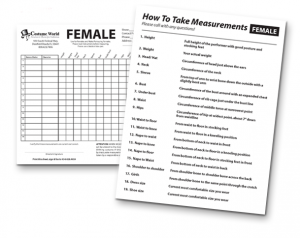 Included in this section is a chart of standard measurement terms and how to take measurements. While these terms are standard in the industry, if you are working with a rental house, be sure to confirm their measurement chart (form) or ask that they provide you with a copy. 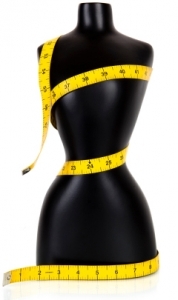 Please note that men’s and women’s measurements differ according to different body types. To get accurate measurements ask your actors to avoid wearing oversize or baggy clothing to measurement sessions. Be certain to use an accurate fabric measuring tape. It is a good idea to have an assistant write down the data as another person takes the measurements. As a guide it helps to tie a ribbon around the actor’s waist just above the hips as a constant reference point during measuring. Finally, it is helpful to keep your records on color coded sheets of paper: Ex., men, women, Act One, Act Two, etc.) and to alphabetize your cast members’ data.